“The Doctor and the Devils” by Dylan Thomas was produced in the Spring of 1972. It appears to have begun the sequence of productions we include on Blunderbuss. The driving force behind it appears to have been Mr Wells, who taught history. It also appears to have been a joint FGS/FGGS production. “The ‘conventional’ stage is certainly very much out of fashion. After two or more centuries of such we are now being told that the proscenium arch is a terrible vice, an impenetrable barrier that necessarily cuts off the audience from the action. To put a play in the round is to involve the audience closely in it, so that they become partakers not just observers. I do not completely hold with these ideas, but I do feel that some plays lend themselves well to such treatment and ‘The Doctor and the Devils’ is one. It was most suitable for this kind of presentation, with the three distinct scenes each requiring little more scenery than a table. However, I thought at times the ‘shared experience’ bit was a little embarrassing; the girls dashing around throwing leaflets to the audience, for example, and the final scene with people shouting from behind the audience, which was most painful if there was one behind you screaming right in your ear. “Of the three zones, I thought the lodging house was the most effective, where an excellently bacchanal atmosphere was created with an overall impression of dirt, rags and drink. The victims of Burke and Hare (the murderers admirably portrayed by Michael Edwards and David Rees) were benumbed with whisky, then taken to the ominous ‘inner room’, the murderers at first excusing themselves (putting a sickly man out of his misery) but later, drunken with the ease and profit of their business, wordlessly dancing an old woman off to her death. Stephen Pallant’s performance as ‘Daft’ Jamie started well but the characterisation tended to become more of a caricature. “The market place scenes I thought were not too well handled, at least with respect to the general background bustle. The cries of the market people tended to be in precise rhythm, not random, and it’s probably for this reason that they never seemed to be trying too hard to sell their wares. The same criticism applies to the children; one felt their shouting was for no reason save that it was a market. “Ralph Dickerson was suitably austere as Doctor Knox, ably supported by Simon Lord and Jeremy Evans. The doctor always seemed totally absorbed in his work, to the detriment of his morals, and ignoring what was happening beneath him, so that at the end we were left with a moving study of a man made guilty by the actions of others, with whom he never made any personal contact. One of the murderers would hang, but, the play intimated, it was Doctor Knox who was ultimately responsible for their actions, since his work was the end justifying the means. “I came to this play with fears that it may have been presented in the round simply to be in keeping with current modes. This was not the case, but I did at times feel that, in the production’s stated aim of departing from the traditional concept of school drama, a full circle had been turned, leaving the play at the point from which it had been trying to escape. 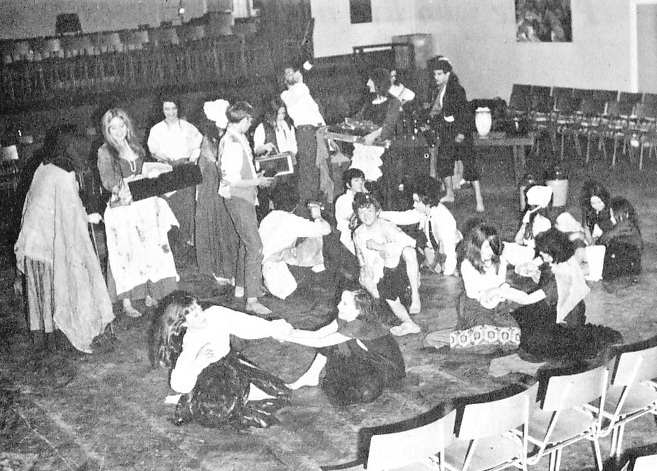 Scene during a rehearsal for “The Doctor and the Devils”.